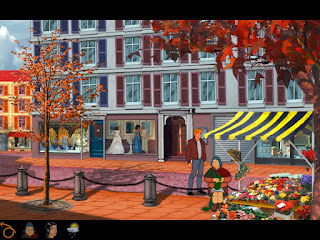 Few computer game series have had such faithful followers as the Broken Sword series. The classic adventure games from Revolution software have rocked our occult/conspiracy loving world since 1996. A group of devoted and talented fans of the series have created a sequel to Broken sword 1 and 2, named cleverly Broken Sword 2.5 as the story takes place between the second and the third of the series. The presentation is the classic cartoon 2D interface that we loved and not the 3D view of the third in the series. The game was available to the german speaking world for a year now but the rest of us had to wait until now for the english patch to enjoy it. The game features full english speech which is rather good considering this is a fan project. The game's production values are very high and are matching commercial adventure games. It even has its own original music score. What can I say, the Germans are very......emmm....german and can pull things like that. Playing the game is like opening a portal back to 1996 to play Broken Sword: The Shadow of the Templars but with a new story. The game is free and you can download it from the game's official website. You need to download the game separately from the english patch and then after installing the game copy the contents of the patch folder to the game folder. When you first start the game everything will be in german. To change it to english click on the OPTIONEN button and change the language form the SPRACHE menu. The game controls are almost the same with the 1st game of the series and will not cause you any trouble. So what are you waiting for. The game is free and will entertain you in a way that only the classic 90s adventures could. The templars are back and they mean business. Didn't know any fan created sequel ever existed. I remember having some fun moments with friends playing those games when in school. This actually feels more of a Broken Sword sequel than the 3rd of the series felt.